After you’re done being terrified by Joker‘s fresh new trailer, you might be wondering if the creepy Batman spinoff will feature the Dark Knight himself. At its core, this movie, set in Gotham City in the ’80s, is really the Joker’s party since it’ll serve as an origin story for the DC villain (who’s portrayed by Joaquin Phoenix). The main cast, stacked as it is, indicates no one playing Batman. Well, technically speaking, we’ll still see Bruce Wayne, just not in his iconic Batsuit or past his teenage years. 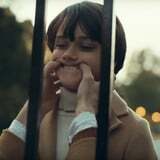 If you were paying close attention to the trailer, you might have noticed a quick glimpse of young Bruce Wayne in a pretty disturbing shot. In one brief moment (at 1:47), Arthur sticks his finger inside of Bruce’s mouth to replicate his notoriously creepy Cheshire grin. Kid Batman is played by Dante Pereira-Olson, who has recently appeared on the series Happy! as Gerry Scaramucci. You might be wondering why the Joker is even involved with young Bruce Wayne to begin with. Well, the answer may lie with how Thomas Wayne (Brett Cullen) fits into the movie. In 2019’s Joker, Batman’s father will be running for the mayor of Gotham. According to Comicbook.com, he plays an important part in the Joker’s origin story and isn’t as sympathetic as he is in other iterations. There are already theories floating out there about Arthur Fleck being Thomas’s illegitimate son. If this is true, it would give rise to interesting stakes for Phoenix’s Joker. Alternatively, Thomas may have just somehow wronged Arthur, who starts off as a struggling stand-up comic before his descent into a life of crime. We’ll see the Waynes, and even Alfred, but on the whole, the movie will be a standalone project about the Clown Prince of Crime and his rise to power. Director Todd Phillips has drawn inspiration from Alan Moore and Brian Bolland’s Batman: The Killing Joke, a one-shot graphic novel that looks into the Joker’s past through flashbacks as Batman tries to stop him from driving Commissioner James Gordon insane. Podcaster Marc Maron, who plays Ted Marco in Joker, explained in a talk with NME that the upcoming movie will emphasize the Joker and his state of mind as opposed to his feud with Batman. “The approach that Todd Phillips has taken is more of an origin story and a character study of a mentally ill person that becomes The Joker,” he said. From the setup of the trailer and Maron’s take, it looks like the film will emphasize the Joker’s pre-Batman past above all else, making it predominantly the villain’s story.